Imagine, if you can, your entire life changing in a flash. Literally, and by ‘flash’ I mean a blinding light the force and magnitude of an atomic bomb. This is what happens to Amaterasu Takahashi in Jackie Copleton’s new novel A Dictionary of Mutual Understanding. She and her family live in Nagasaki and on August 9, 1945 instead of meeting her daughter at a nearby church, she goes into a shop to buy candy. In the instant of the bomb’s impact, she loses both her daughter and her grandson. A year later she and her husband move to America in order to immerse themselves in a culture so foreign it will erase their grief. There they carve out a quiet life until almost forty years later when a middle-aged man, terribly disfigured, appears on Ama’s doorstep and says he is Hideo, her grandson. 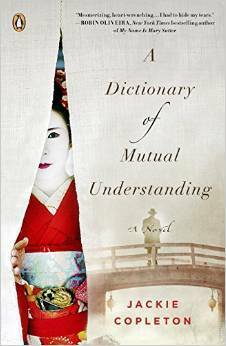 A Dictionary of Mutual Understanding is not a feel-good novel of reunion story. In Amaterasu Copleton creates a deeply layered woman who not only deals with survivor guilt, but grapples with her daughter’s life and actions, her own past and how all of these have come together with the appearance of this stranger. For the first time since she left Japan, she reads her daughter’s diary to try and piece together her life. The stranger has given her a sealed box of letters written by the doctor, Sato, who adopted him and who also is known to Ama. Copleton blends Ama’s memories with her daughter’s diary and Sato’s letters to unpack a past that goes far beyond her daughter’s life and foreshadows the consequences of the choices each of them made. Copleton writes Dictionary with a restraint that feels Japanese in its perspective and helps explain some of Ama’s choices and mindset. It goes a long way to carrying the novel’s plot even when the simple solution of a DNA test is never suggested. Concrete confirmation that this man is her grandson is secondary to everything else she needs to reconcile. Dictionary may stretch the boundaries of credibility at times but overall Copleton provides a gripping narrative of a time and place, Nagasaki before and after the bomb, that is not often captured in fiction. In doing so, the reader is pulled along with Ama as she has to decide how much proof is needed to let go and love. Oh wow, this is going on my TBR list right now.